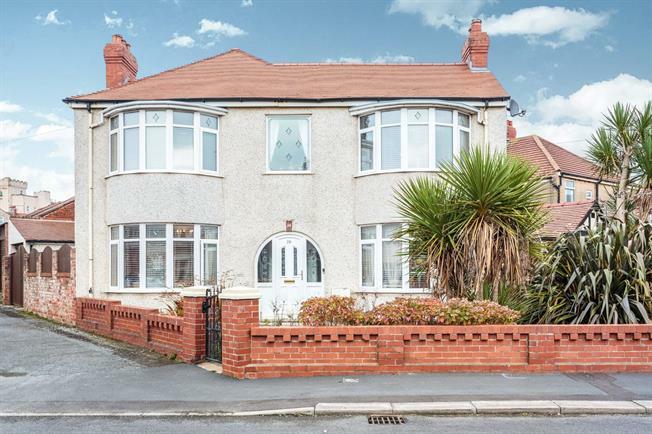 3 Bedroom Detached House For Sale in Blackpool for Asking Price £220,000. This outstanding three bedroom detached property offers a wealth of spacious accommodation throughout and would make the perfect family home. On internal inspection to the ground floor there is a superb welcoming and spacious entrance hallway, two good size reception rooms, dining room leading into the modern fitted kitchen and there is a also a wc room. To the first floor there is a large galleried landing area, two double bedrooms, good size third bedroom, separate wc and a stunning three piece modern fitted bathroom. The property benefits from UPVC Double glazing, gas central heating, low maintenance front and rear gardens, off road parking and a detached single garage to the rear. Viewing of this outstanding property is simply of must to fully appreciate the full size and quality on offer. UPVC double glazed door. Double aspect double glazed uPVC windows facing the front. Carpeted flooring. Radiator, laminate flooring, under stair storage, original coving, spotlights. Double glazed uPVC bay window facing the front. Radiator, laminate flooring, original coving. UPVC double glazed door. Double glazed uPVC box bay window facing the side. Radiator, laminate flooring. Double glazed uPVC window facing the rear. Laminate flooring, boiler, part tiled walls. Fitted and wall and base units, stainless steel sink and one and a half bowl sink, integrated, electric oven, integrated, electric hob, overhead extractor, space for standard dishwasher, space for washing machine. Double glazed uPVC window facing the side. Laminate flooring, part tiled walls, spotlights. Low flush WC, bowl sink. Double glazed uPVC bay window facing the front. Radiator, carpeted flooring, fitted wardrobes, original coving. Double glazed uPVC bay window facing the front. Radiator, carpeted flooring, fitted wardrobes, original coving, spotlights. Double glazed uPVC window facing the side. Radiator, carpeted flooring, fitted wardrobes, spotlights. Double glazed uPVC window facing the rear. Heated towel rail, tiled flooring, part tiled walls, spotlights. Jacuzzi, corner shower, pedestal sink and wash hand basin. Double glazed uPVC window facing the rear. Tiled flooring, part tiled walls. Low flush WC. To the front of the property there is flagged garden with established shrub borders and driveway to the side. The low maintenance rear garden is flagged with gated access to the side and and has access to the single detached garage that benefits from both power and light.